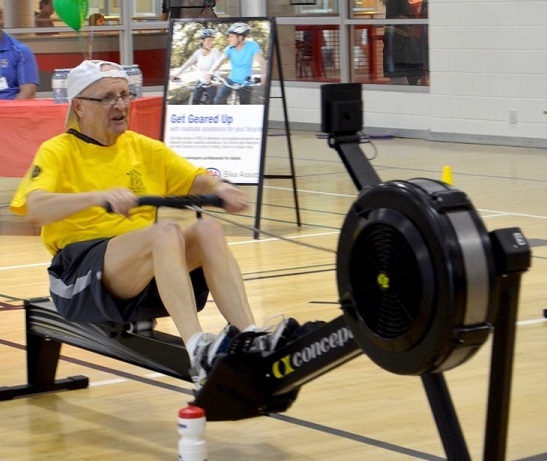 Rob Welch takes on an ERG for Y Kids! Rob Welch, Senior Partner at Lancaster Brooks & Welch LLP tackles the ERG for YMCA’s “Move for Kids” event on Saturday February 24th. Within 45 mins Rob was able to complete an impressive 7.5 km on the beast, and still have enough wind left to talk about it! He thanks everyone who sponsored him for this great event that allow families to benefit from the Y’s many outstanding youth programs. YMCA Move for Kids invited superheroes of all ages to participate in a fun, noisy beach themed event, that brought together over 700 participants and volunteers across the region to spin, walk, swim or run to support our local kids. 100% of funds raised will allow children from families who face financial barriers to access YMCA membership services such as youth programs and swimming lessons as well as YMCA day camp. Last year cyclists across the Niagara region covered a total distance of 9775.5 km on spin bikes! That’s the distance to Mexico City and back! $63,494 was raised to support 461 kids to learn to swim or have fun at camp.